Spooky locations -- including real-life haunted houses -- where you can put your bravery to the test this month. With a combination of real lore and just-for-Halloween frights, ghost hunting comes alive this month in Reno. Towns like Virginia City and Carson City offer up historical spooks with a variety of ghost and haunted history tours, and pop-up supernatural attractions add to the spook factor just in time for Halloween. Brave enough to test yourself against the ghosts of the past and the terrors of the present? Try these haunted attractions on for size — but don’t say we didn’t warn you. As steeped in pioneer history as the area is, it’s not really surprising Northern Nevada is home to some of the most haunted places in the country. Virginia City has Bats in the Belfry Ghost Tours and Investigations, who are offering several nights of haunted encounters this Halloween. Brave tour-goers will try their hands at dousing rods, temperature gauges, EVP (that’s electronic voice phenomena) and even a spirit box. Tour guides report findings of EVPs all over Virginia City, where they have captured what are purported to be ghostly voices answering questions on the recorders. Bats in the Belfry will lead Halloween tours for four nights Oct. 27-30 with walking tours at 6 and 8 p.m. and an investigative tour at 10 p.m. Visit their website for details and ticket prices. 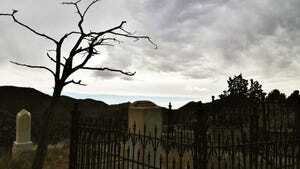 Virginia City isn’t the only place to find ghosts this Halloween. Carson City is hosting guided Historic Ghost Walks departing every 30 minutes from 10 a.m. to 3 p.m. Oct. 22. Costumes are welcome, so bring the kids for trick or treating. The Talking Dead Tour (90-minute): This tour features five home tours and stars McAvoy Layne as Mark Twain at his brother, Orion Clemens home and The Nevada Gunfighters. All tickets are $15 in advance and $20 on the day of the event. Kids under age 3 are free. The Scalawag Tour (50-minute): This tour through the historic downtown is created especially for kids and families enjoying a shorter walking path as you meet characters from Grimm’s Fairytales. Tickets in advance are $5 for children 12 years and under and $10 for general. Tickets on the day of the event are $7 for children under 12 and $12 for general. In Truckee, Trails & Vistas presents an eerie experience exploring ghostly tales in their Truckee’s Haunted Historic Tour. During the walkabout through the area’s sinister past of yesteryear, participants will be guided through the first home, first school, first church, the oldest building and the oldest retail store in Truckee. This 21 and up tour is Oct. 13 and 14. Groups leave every 15 minutes from 5 to 8 p.m both days with the last tour ending at 10 p.m. Tickets are $45. If you're looking for a thrill, Reno has two haunted attractions to test your mettle against ghosts, goblins and the ever-dreaded clown. Reno Fright Fest Presents Slaughter House Thursdays through Sundays throughout the month and features a terrifying catacomb located within Greater Nevada Field. Tickets are $17 per person general admission or $24 for VIP passes. Doors are open 7 to 11 p.m. Thursday through Saturday and 5 to 9 p.m. Sunday. Finally, Kingdom of Horrors at 515 E. 7th St. brings haunted Kilburn Estate to life. Adventurous souls can explore the estate, choosing between two paths that promise entirely different stories — and scares. Tour the haunted property Fridays and Saturdays in October from 7 to 11 p.m. On Halloween weekend, the estate will be open Oct. 27, 28, 29 and 31. Tickets cost $12 per person or $15 for VIP passes.